When I was pregnant with my first child I had an addiction to root beer floats. I was also addicted to gyros and fat french fries, but those I couldn’t make at home every night! It’s hard to believe that was over 14 years ago. Man, I’m old. Just the reality of that makes me want to grab another bite of these fudge pieces. I can’t even begin to describe how delicious these taste. One, because I’m a horrible writer…two, because you just have to try them to understand how unique they are! If you eat them cold you may even convince yourself, just a little bit, that you are eating the crunchy part of a root beer float (you know the ice cream with the frozen root beer crystals, yum)! These were a huge hit in my family. So much so that I’m not sure I should ever make them again. I ate way more than my share, more than several people’s share. Ahhh, but it was so good. And it brought me back to being pregnant with my oldest child. And for just a moment I felt young again. Until I opened my eyes and realized I had 8 loads of laundry to do, dog puke on the carpet to clean up, and 18 extra pounds on my hips. Learn how to make fudge with my helpful guide, full of tips and tricks for you! In large saucepan, heat sugar, butter, salt and cream until combined. Bring to a boil and stir continuously for 4 minutes. Remove from heat. Quickly stir in white chocolate and marshmallow. Whisk in vigorously until smooth, be patient this will take a couple minutes. Using an electric mixer yields best results. Pour half of mixture into a parchment paper lined 13x9 baking dish. To remaining fudge, whisk in root beer concentrate. Stir until combined. 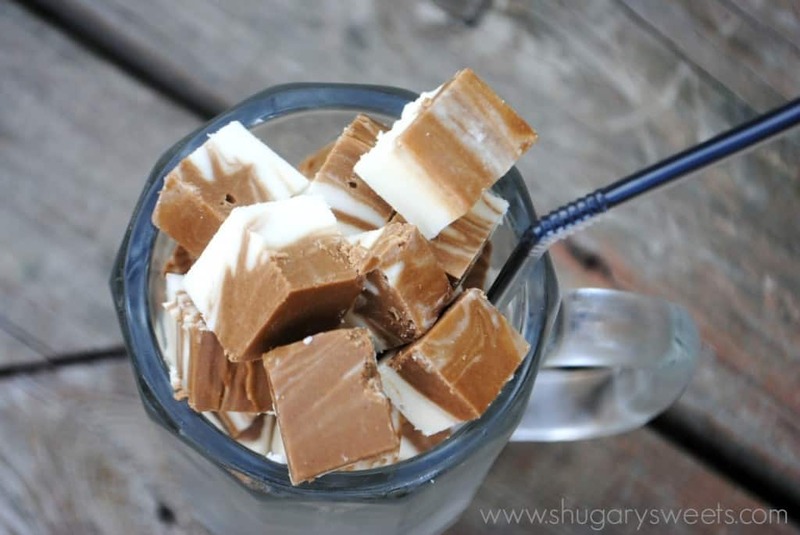 Pour over white fudge. Using a knife, swirl the two together. Refrigerate 4 hours or overnight. 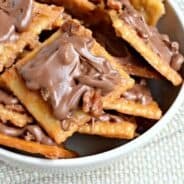 Cut into bite size pieces and enjoy. Tastes great cold! What a great idea. Looks so delicious. Love your pictures. Come over and visit us today. We have a really wonderful pimento cheese recipe to share. Oh my heck, how I have waited all week for this recipe!!! YUM! *I love the way you “plated” it! Thanks Amiee for another HIT! I agree, great photo styling! Your blog never disappoints. I love coming back to visit. This recipe looks amazing! My goodness these look fantastic! are you kidding me with this! YUM! and what a brilliant idea! This looks incredible. I can’t wait to make this. I linked to you from Melt in Your Mouth Monday. I will be making this to send to my son who is away at school. He will love them! Okay you are a genius. I must try these. This looks incredible. Just stoppin’ by from Tasty Tuesday and I must say that fudge looks divine! I’m sure it’s very tasty and one I’m going to bookmark and make sometime. Thanks for sharing! oh me this is amazing, my husband would love it. Thanks all, they are so dang tasty! Hi – I made these last night and my rootbeer 1/2 came out beige. Is there a secret to getting it brown like the picture? They are amazing though!! Thanks! I just finished making these with Watkins root beer extract, which is brown, but it came out mostly beige too :/ I’ll have to use McCormick’s next time! Yep, all I’ve ever used it the McCormick’s…it gives such a rich brown color…. This looks so tasty and fun– what a brilliant idea and so different from the norm! I love root beer. I’ve been obsessed lately. So I need to try this fudge! Stacy, YES you can! Thanks for stopping by and saying hello! I cracked up when I read the first sentence of this post, because I, too, had an addiction to root beer floats with my first child. She is only three, though, so not quite in the distant past. I cannot wait to try these! I have everything except the root beer extract, so I’m adding it to my grocery list. This recipe sounds worth the splurge! Oh. My. That looks awesome!! Thanks for linking up to 2 Maids a Baking!! Ah, YES PLEASE!!! Just pinned this to make! Can’t wait. Thanks! I just made this last night for my mom, who loves root beer and needs a pick-me-up – she goes into the hospital this week and I know these will brighten her day! Holy cow, this looks awesome. Fudge and me, we’re the best of friends. I’ll definitely be giving this a try! Thanks! I am on a root beer kick right now! I just had homemade root beer (at a restaurant) last weekend and that is all I am thinking about. Where do you buy the extract? Is that just a Walmart? I will have to start looking around for it! I have never heard of this! I can’t wait to try it! We would love for you to share this at our weekly link party this Saturday. We have an awesome jewelry giveaway going on right now, too! Come stop by! 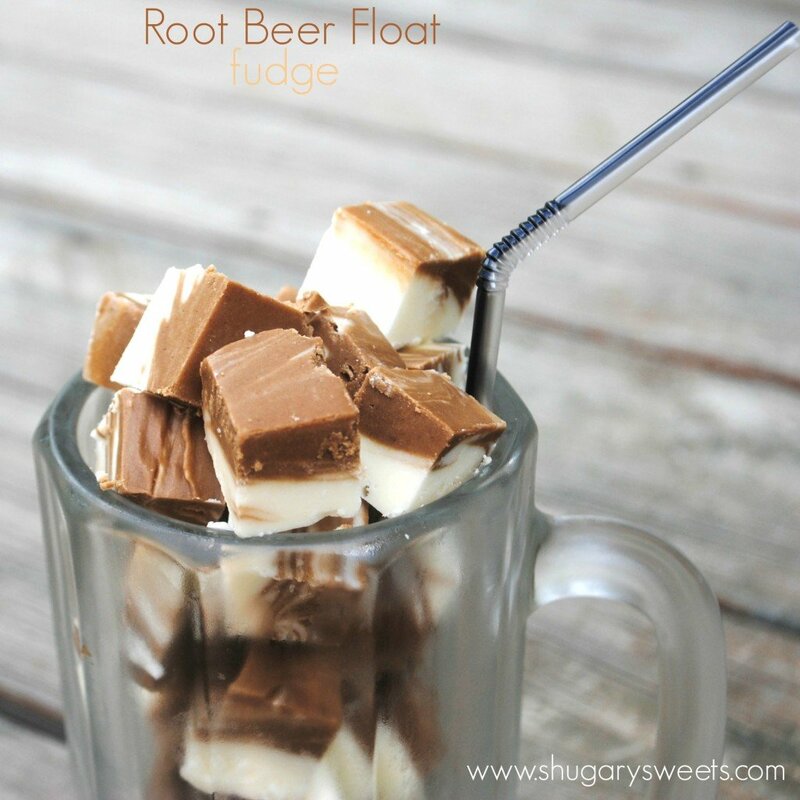 Whoa, we love root beer floats at my house, this looks so good. I can’t wait to try it. pinning this one – it sounds so good! You are a saint! I can’t wait to make these! Stopping by from Totally Tasty Tues.
Oohh, how did I miss this little morsel of delight. i craved root beer during pregnancy too, sooo weird. And so did my sister in law. Whoa, I wonder if there’s some wives tale to this… Anyway, these look AMAZINGLY delish!!! We love fudge, all kinds! Oh, yum! I love root beer! Wish you were my neighbor just to get a taste. I’m afraid what would happen if I made these…I might eat them all! I would love it if you linked up to my Hi-5 Friday party. Thank you for linking your wonderful recipe to Fat Camp Friday. I would also love for you to join my new forums and link up your website and any linky parties you host! Have a great weekend! I wanted to let you know that I featured this on my “What I Bookmarked This Week” post today. Stop by and see! HOLY YUM Batman! I can’t wait to make these!!! Oh My! This sounds delicious. 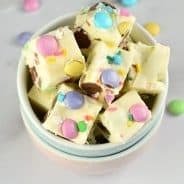 I can’t wait to make a batch of this fudge. I love rootbear floats. Oh MY heck!!! this sounds fantastic!! 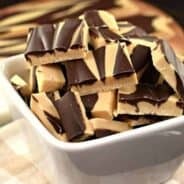 Another beautiful and interesting fudge from your kitchen. I’d like to invite you to share your recipe on Sweet Indulgences Sunday this week. Sounds amazing! I’ll have to look for Root Beer extract, thanks! I really want some of these! It looks so good! Thanks so much for linking up to Tuesday Talent Show! I would love to have you stop by and link up again tomorrow with more great projects! Who’d have thought you could make root beer float fudge?!?! You are a genius! I am pinning this! Thank you! So excited to try these! Aimee – do you mind if I share this recipe on my blog (I’ll be sure to attribute it to you, of course!)? I made it to send to my mom who’s in hospital and she loved it! It’s such a great idea! We tried your recipe today! I have a question. We didn’t get the two different colors with ours. We used rootbeer concentrate, because we couldn’t find extract. Is that the reason for the color difference? It tastes excelent, but I would love to have that swirled effect. Any help you could give would be outstanding! Thanks! Kathryn, I use concentrate as well. I’m assuming when you say it wasn’t swirled, was it just a brown color from the concentrate? I separated half the white fudge out before adding the concentrate, thus when I poured the brown fudge over the white I swirled them together. Hope that helps!!! It wasn’t that it wouldn’t swirl. The half that I added the rootbeer concentrate to just stayed white, so it’s all one color. I’m not sure what I did wrong. It’s like the concentrate didn’t make the half brown. I used McCormick Root beer concentrate, it’s a dark brown liquid, so it naturally colored the fudge. Was your concentrate brown or clear, I guess that would make a difference! Aimee, I have made five batches of this and it is HEAVEN. This will be my go to dessert for EVER now! I made a batch with the Watkins concentrate and it was not as flavorful I thought and the lightness just made me feel that it wasn’t as RootBeer-y… I also used the extract, but mistake, so you’re right McCormicks is the way to go. My honey lives in Georgia and I sent him half a batch of these and he begged for more. Glamour magazine has their “engagement chicken”… I think this is engagement fudge! Thank you SO MUCH for sharing this!! haha! Jennifer- I’m so glad you enjoyed it. Good info on the flavorings. I’ve only used the McCormicks! We just finished our batch – it’s delicious! But my root beer layer isn’t brown, it’s white – so we don’t have the pretty effect. I just looked at my bottle of extract – it’s Watkins. Maybe that’s the difference? Next time, we’ll toss in a drop of brown food coloring. These look so good! Why can’t I have you as a neighbor?? 🙂 And I’ve never heard of root beer concentrate, where have I been?! Aimee, you’re the Fudge Genius!! I made this tonight but mine did not look like the picture. I followed the instructions exactly but mine did not have the pretty brown color. Also, you could taste the sugar grain. I mixed it until it was very smooth. Do you have any suggestions to help me improve it for the next time? Couple things. First, I use McCormick Root Beer Flavoring. It’s a very dark color. Most other brands are not as dark, so that could have been why your brown is different?? Which brand did you use? Also, did you boil for the full time, at a rolling boil? I know some stovetops vary in heat, there shouldn’t have been any sugar grain once boiled. Maybe next time add a minute or two onto your boil time. Thanks for the ideas….I will try those. I did not use Mc Cormick’s. I’m going to try again because my kids liked it even with grainy texture…lol. I will let you know how it goes. BTW, I love your blog!!! This fudge was delicious! I think though next time I will add just a bit more root beer. I did not get McCormick’s though it smelled like root beer, was %100 pure root beer extract, but I didn’t get the dark color. The top layer was barely a darker ivory and the root beer flavor was a little too faint. None the less, it was very tasty and everyone else loved it too. Thank you! This was so funny to read, it was like reading the story of my life. I was also addicted to Root Beer Floats during my first pregnancy. I would “drink” mine with a spoon (I liked to make them thick) and loved to skim those ice crystals off and eat those. 🙂 Now I feel an urge to run out to the store for some chocolate chip ice cream and some A&W root beer! lol ….. will definitely try this fudge (something else I love to eat). Thanks! These look so delish…and my boyfriend saw my re-pin of these and immediately said I had to make them lol. Thanks so much for sharing!!! I have LorAnn Root Beer Flavor 2 dram size bottle/ says Highly concentrated flavor… what do you think about using this and how much would you suggest? could we not use some brown coloring if we don’t get the color from the flavoring? I’ve never used that brand, so I’m not sure what to suggest. As for food coloring, you have to make sure you use candy coloring because your chocolate would seize with regular food coloring. Thank you for another great recipe! I made 2 batches of this, 1 for a bake sale and the other for family and gifts. I can’t believe how much this taste just like a root beer float. I can’t wait to try more of your recipes!! Where can I find McCormicks Root Beer Concentrate? I looked at my local grocery store, and couldn’t find it. Maybe I was looking in the wrong aisle? Can’t wait to try it! Thank you! I’m not sure where you live, but I find it in the baking section (near the vanilla extract). I find it at my local Meijer and Kroger. Maybe see if McCormick.com has a product locater? I can’t wait to try these! Oddly enough I too craved root beer and root beer floats when I was pregnant with my oldest! Thanks for sharing! The picture and recipe looks delectable! However, there’s a fail in mentioning how the milk chocolate is flavored with the root beer consentrate. The rootbeer consentrate isn’t what contributes to the rootbeer color as the fudge’s top layer. When I made this recipe, I made the white chocolate fudge as instructed. Then I made chocolate fudge and mixed the rootbeer consentrate into the chocolate fudge. I used watkins brand of rootbeer consentrate. This consentrate is also dark brown but didn’t turn the fudge color brown. How would I stop myself from eating the whole cup?